Simple, yet fantastic buttery glaze that bakes right into the salmon. Mix up a basic butter compound with your favorite seasoning blend and let it melt right into the salmon, as it bakes to perfection. Cut salmon fillet into 4 pieces. Place in small baking dish and season with salt and pepper. Add a dollop of the butter compound onto each piece of salmon fillet. Bake in the preheated oven for 15 to 20 minutes, or until salmon is no longer pink in the middle. Cooking time may vary depending on thickness of salmon. 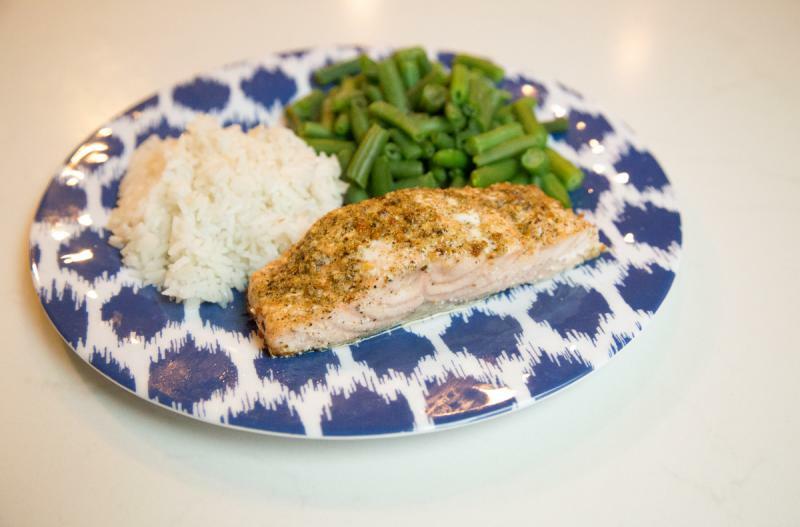 Serve Buttery Salmon with rice and veggies. Let the 8 Tbsp butter soften and then combine it with 4 tsp seasoning blend to make a compound. Recipe is dairy-free when you use margarine instead of butter.